This festive season we bring you all the news and updates on how Toybank is bringing cheer to kids all over India! Let's start with how our Bombaat Bengalooru chapter is doing and the events we have had so far in this year! December 25th,2008 - Few volunteers in Bangalore came together and arranged a Toy Collection drive at a Motorola office. The response was great! The toys collected were segregated and gift wrapped on Christmas day and the same day we did a Toy distribution event at Karnataka Anatha Makkala Abivruddhi Samsthe, Banashankari III stage and distributed toys to 25 kids from this privately run orphanage. February 28th,2009 - We visited the kids at Swanthana. Swanthana, a mission of the Daughters of St. Camillus, is a centre offering care and protection for mentally challenged children in Bangalore. Currently it is home to 31 abandoned mentally challenged and spastic girl children including infants and pre-teens. The home has infants who have been abandoned by their parents at hospitals and other places since they are spastic, MR. or have severe disabilities. Also similar children who have been picked up by police from railway stations and other public places or have been in government homes but could not be cared for due to their special needs are taken care of. 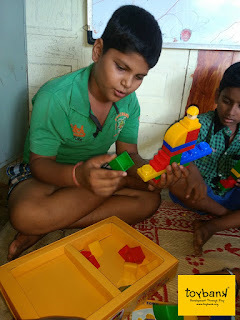 "It was an initiative taken by Toybank to visit Swanthana on Saturday 28th Feb. 6 of us went to Swanthana to meet mentally challenged kids and to spend sometime with them. All Kids welcomed us with smile on their face. We started the day by giving soft toys to the kids – who really enjoyed our presence rather playing with toys. Some kids called us anna, akka, mama etc.. really we felt something different at that situation and we were really happy to spend time with them. After playing with the kids, we went with them inside their house; it was time for them to have lunch. But some kids on that day were not willing to have lunch on their own and everyone was waiting for us to feed them. It was a nice experience for all of us. We had also got cradle and cot along with toys which we assembled before leaving Swanthana. It was a great experience in our life to spend sometime with the kids. We really felt great at the end of the day." February 28th, 2009 - 8 volunteers distributed toys to kids from Sadashraya, an orphanage near Electronic city and reached out to 30 kids! May 16th,2009 - We organized a toy distribution event for the needy and disabled children participating in a summer camp at Lakshmipura in Tavarakere, Magadi Road, Bangalore Rural. IAR (Indian Agency for Rehabilitation) India conducted this summer camp from May 13-16. They do it every year and they call it as the Tavarakere summer camp project. We reached out to 50 kids from the camp! 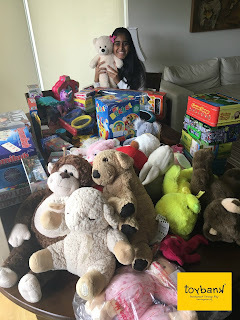 July 2009 - Employees in ANZ, Bangalore organized a toy collection drive for a week in July. The toys collected are waiting to be wrapped and distributed! Way to go Bangalore! If you wish to get on board with us mail us right away!